This is a part of the squid that many people do not have the opportunity to try. 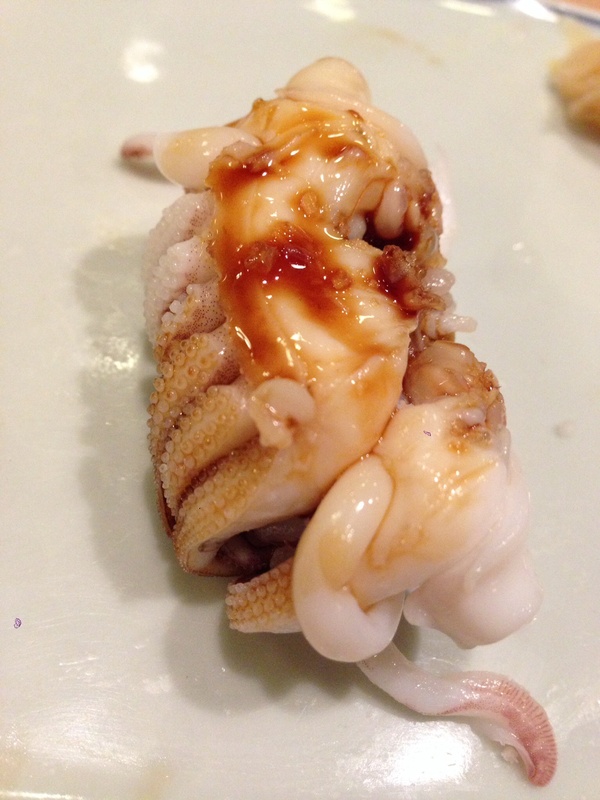 This is what we call the tentacles of the Squid which are quickly boiled and then preserved until they are ready to be served during a course of sushi. If you look carefully at the photograph you can notice the very small suction cups which are part of the tentacles, which are one very well-preserved in this photograph and add to the texture and taste of the Geso. There is a very well-known character that exists in Japan. Name is, Squid Girl, a girl from the ocean who possesses squid-like tentacles. She vows to invade mankind as revenge for its pollution of the ocean. Her first task is to make the Lemon Beach House, owned by the Aizawa siblings, her base of operations. However, when she accidentally breaks a hole in their wall trying to swat a mosquito, she is forced to work as a waitress to pay off the damages. Thus, Squid Girl begins her life on the surface, learning new things and encountering many curious visitors to the beach house.